Our old gentleman Jake T. has lived for the past 3.5 months in a shelter. You might think that living in a shelter that long would be a very unpleasant way to spend your time, but not true for Jake because he was at the Sonoma Humane Society (I swear SHS could be called a B&B for animals) and furthermore Jake was a favorite of the staff. He is now in the Thulani Program, but we will need to work very hard to upgrade his living conditions. We will need to find the perfect forever foster home for Jake. 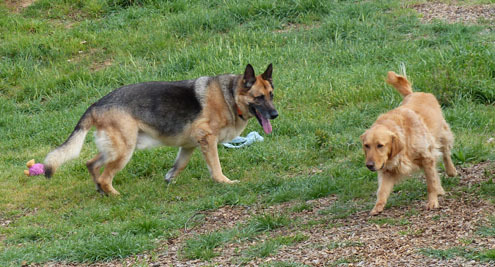 Jake and his younger sister were brought to the Sonoma Humane Society around Thanksgiving last year, supposedly for a limited stay while their family sorted out some difficulties. Both were a bit out of control. After more than a month, the family informed SHS that they would not be reclaiming him. Meanwhile, the people in the Training and Behavior Department had been working with Jake to give him some training, manners, and respect for people leadership. They also really spruced him up (he had just come from the groomer when we evaluated him). 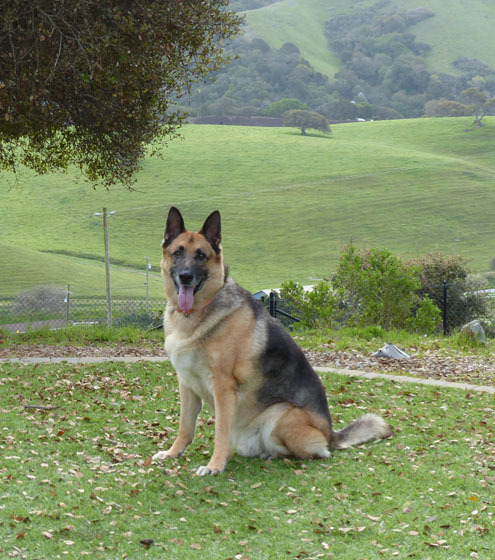 When they realized that he would not be reclaimed, they put him up for adoption knowing full well that a 12 yr old male German Shepherd was going to find it difficult to find an adoptive home. One of our Thulani fosterers noticed a posting about Jake and his availability, and suggested we contact SHS regarding the Thulani Program and our potential interest in bringing Jake into the program. The people at SHS warmly welcomed our inquiry, and we brought Jake home five days ago (to a chorus of enthusiastic Goodbyes from the staff and volunteers). Jake is a friendly, spry, mobile old gentleman who gets on well with people and dogs (he has been running free with my 4-furpack, everyone completely at ease). He loves to go for walks, gallops up and down stairs, loves to explore our large tree-lined backyard, and really loves treats. He should be wearing a sign “Will Work For Treats”. He knows some basic commands and walks very well on lead. He is very much a people-focused dog. 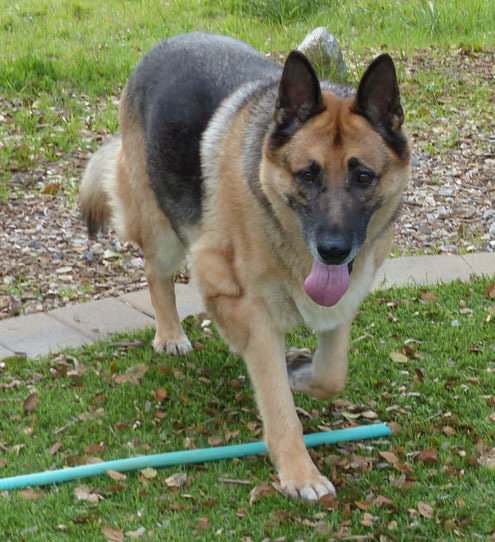 Being 12 years old, Jake has his share of lumps and bumps, has a bit of a wobbly rear-end if he tries to take corners too fast, and he has a large spindle-cell sarcoma on his elbow. The sarcoma is not operable, but does not seem to be overly bothersome to him. He is on Rimadyl and a mild pain med, and probably will be for the rest of his life. 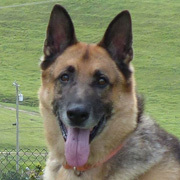 Jake T. is ready for his forever foster home. He would do just fine as an only dog as long as his people were around most of the time. He can also live comfortably with other dogs. He is unknown with cats. Remember, because he is a Thulani Program dog, we will cover all of his expenses for the rest of his life. If you are interested in learning more about Jake T. or are interested in possibly being his permanent foster family, please contact Bob at thulanidogs@gsrnc.org. This entry was posted by admin on January 7, 2013 at 2:11 am, and is filed under Recent News. Follow any responses to this post through RSS 2.0. You can leave a response or trackback from your own site. I LOVE these stories !! Good for you Jake, enjoy your new life.